I made these neiappams for today's evening tiffin. My patti used to be an expert in making neiappams. She had her iron appakaaral. I used non-stick appakaaral for making this neiappam. This time I followed Aparna's Neiyappam recipe, instead of my patti's. Both were almost same except for the fact that my patti usually add couple of teaspoons of ghee to the appam batter. 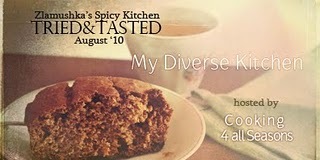 Aparna's My Diverse Kitchen blog has been chosen for this month's T&T event by Srivalli, initally started by Zlamushka, currently taken over by Lakshmi. 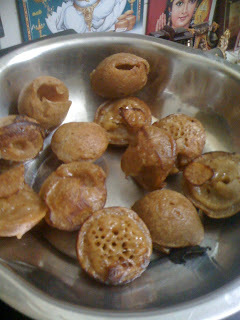 Wow very tempting appams,feel like grabing some;. I love how beautifully porous these are! I am sure that I will love to taste them too! I love neyyappams. Looks good. Thanks for cooking from my blog.